An unassuming book with a tale to tell. The cover to Crime and Detection, (Second Series) published by Oxford University Press as part of its World's Classics series. It is about as modest a little book as you would ever hope to see. In size, it is little more than a paperback: 6 inches tall by 3 and 3/4 inches wide. It would be easy to let your eyes roam right past it on a shelf. Unlike a paperback, this is a hardbound volume, the covers a deep, royal blue. But even here, on the cover, there is but a simple stamp on the front cover of a seal that needs a bit of work to make out. Published by Oxford University Press as part of its World's Classics series, the book was printed in London by Humphrey Milford, "Publisher to the University." Even the gold gilt title on the spine feels reluctantly placed: Crime and Detection/Second Series is at the head and the publishing company, Oxford is at the foot. And the contents are pretty common by today's standards too: short stories of detection and mystery by Nathaniel Hawthorne, Edgar Allan Poe, Sir Arthur Conan Doyle, R. Austin Freeman, Dorothy L. Sayers, G.K. Chesterton, and others. In all, this little book feels like the kid who sits in the back of the class in nondescript clothes and hopes the teacher never calls on him to answer. But oh, what wonders there are when you slip it open. 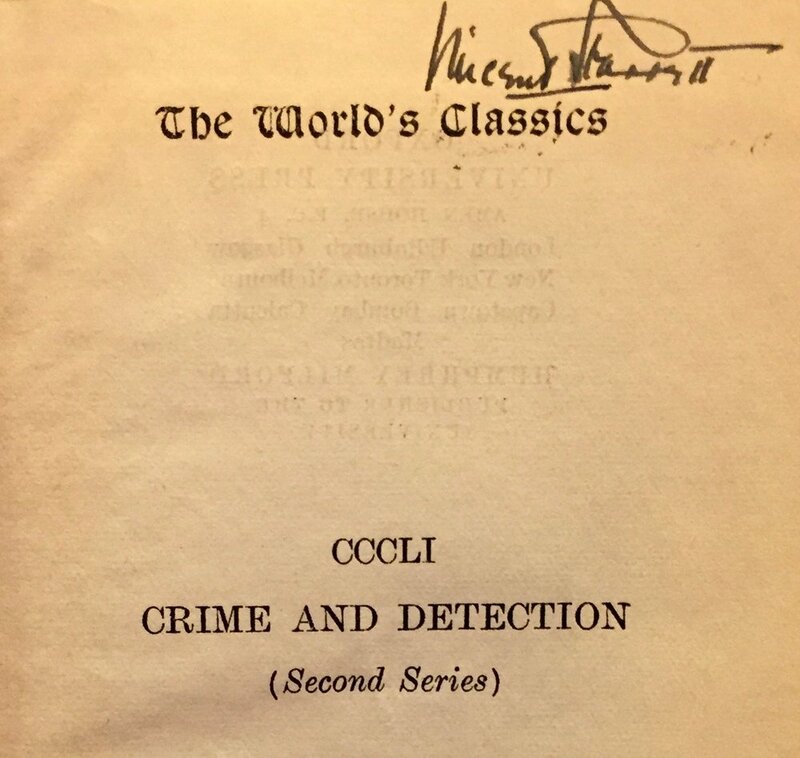 The front inside cover of Crime and Detection, with Starrett's famous Sherlock Holmes bookplate and a sticker from Foyles in London. On the inside cover is the familiar bookplate designed by Vincent Starrett's friend, Fridolf Johnson. Sherlock Holmes peers out at you from under his deerstalker cap, pipe in hand, a half-smile on his good-humored face. "From the Library of Vincent Starrett," runs along the left and over Holmes' image. In the lower left corner is a stamp that brings back good memories: The image is an opened green book, with "FOYLES" on the spine, "CATALOGUES/FREE" on the front cover and "CHARING/CROSS RD, LONDON/W.C.2." on the back. And here I'll say that I won't be telling you from whom I purchased this book. What I can say is that I was contacted by the previous owner who was looking to downsize his collection and we agreed on terms. I do thank him, here publicly, for thinking of me. The book was added to my collection over the winter. I've picked it up to admire it several times since then, but only in recent months have I done any real thinking about it and its history. If the book only held these two items, it would be a lovely addition to the shelves. But there's more. Before I go too gaga, let me plant my feet back on the ground and approach this with Sherlockian detachment. There are a few initial questions which need consideration. One wishes there were greater bits of information here. There are hints, but also missing elements. The inscription is undated, and contains no information on where or under what circumstances it was signed. I've talked with a few dealers and corresponded with other collectors with more experience, and they believe it certainly looks like a real "Ellery Queen" signature. You can compare this signature with others here and here. At the same time, I've been told that to have both "Ellery Queen" and "Barnaby Ross" in one inscription is uncommon, but not unheard of. Researchers who have seen the Queen books at the Harry Ransom Center in Austin, Texas, report that the books there carry both the Queen and Ross signatures. Let's see what else we can sort out, shall we? Published by Oxford University Press as part of its World's Classics series, the book was published in London by Humphrey Milford, "Publisher to the University." The publication information gives us 1935 as a starting date. Where to go from there is a bit of a puzzle. The University of Minnesota has correspondence between Starrett and Frederic Danny from the early to mid-1950s. If the correspondence mentions this book, then we can give it a date. This bears additional investigation. Starrett's signed the book as well as "Ellery Queen" and "Barnaby Ross." If you clicked on the earlier links, you would likely conclude that the "Ellery Queen" signature came from Frederic Dannay and not Manfred Lee. This makes sense. Dannay was more interested in Sherlock Holmes than his cousin. Dannay was a regular at BSI dinners, while Lee attended just one. So it would be a reasonable deduction that an association built on Holmes, Starrett's own mysteries and a shared delight in detective tales would exist between Starrett and Dannay. At the same time, the first link that I can make between "Ellery Queen" and Starrett was not a promising basis for a friendship. Yet as time went by, "Ellery Queen" clearly came to appreciate Starrett's work. For example, in 1944 when The Misadventures of Sherlock Holmes was published by Little, Brown & Co., under "Ellery Queen's" editorship, the introduction to Starrett's "The Unique Hamlet" could not have been any more complementary.
" 'The Unique Hamlet' is Vincent Starrett's most devout achievement in a lifelong 'career of Conan Doyle idolatry.' In is unanimously considered one of the finest pure pastiches of Sherlock Holmes ever written." "Mr. Starrett, probably the outstanding authority on Sherlock in America, has never written a line about Homes that hasn't tingled with interest, speculation, and intimate knowledge. His book, The Private Life of Sherlock Holmes (New York: Macmillan, 1933) is easily the most fascinating work of its kind." Similar sentiments regarding Starrett's work, Sherlockian and otherwise, are expressed in later works edited by "Ellery Queen." So to see that Dannay autographed an item from his library for someone who had become a kinspirit is not a surprise at all. To have that work on my shelves is an unexpected honor.